Features: The RFIDprotect Passport holder is a compact, lightweight PU leather passport holder with a built in Trace it Tag that acts as your travelling personal assistant. 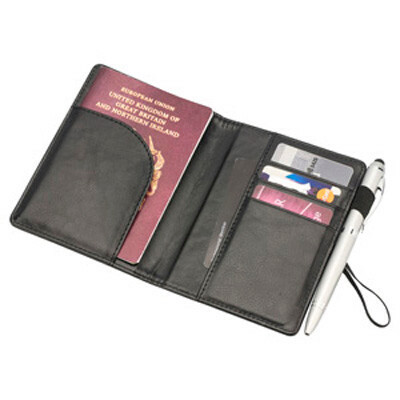 Manufactured using the latest state-of-the-art fabrics this passport holder blocks out unwanted scanning devices and stops personal information from being accessed by identity thieves. The smart tag and its free APP offer extra security by preventing you misplacing your device or important travel documents. Compatible with smartphones and tablets (iOS and Android). Includes spare battery and user manual. Material: ABS, Material: PU Leather.. Certification: CE, FCC. Product Colour: Black. Product Size: 137 x 100 x 13 mm. Print Area: 50 x 20 mm. Print Process: Pad Print. Delivery: 2-4 weeks (indent) from art approval. Standard Packaging: PSL Design Box. Packing Details: 100 pcs per carton, 10.5 Kgs, 57x22x32 cms. Setups: Included.